As well as increasing their confidence, patience and empathy, Nightline volunteers have been quoted as saying they also develop a wide range of skills transferable to the workplace such as active listening skills, maintaining confidentiality, understanding policies and working as a team. Having volunteered with an organisation like this is great on a college resume, and also contributes directly to a UCC Works Award. Anyone who wants to should apply and volunteer. 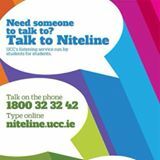 If you feel you have what it takes to be a Niteline volunteer then please drop us an email at committee.uccniteline@gmail.com with the subject line VOLUNTEER. We will also have a stand outside the library during Freshers Week from 10-3 every day where you can sign up and we will forward you an application form by email.